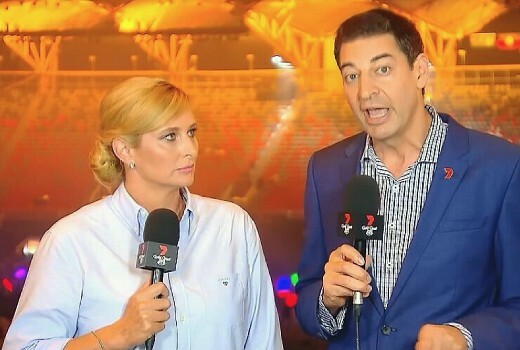 Seven commentators Johanna Griggs and Basil Zempilas last night slammed Commonwealth Games organisers for a woeful Closing Ceremony. The event included an extended concert, arena dancing, speeches and the handover to 2022 host city Birmingham. But it broke with tradition by not welcoming the athletes onto the ground. Social media went into meltdown over the snub, and in an unprecedented move the Seven hosts slammed their own event Live on air. But Griggs did not hold back. “I’m sorry, you’re being way too polite,” she said. “People are thinking that Channel Seven has chosen not to show pictures of athletes or not to show the flag bearer Kurt Fearnley and other flag bearers as the nations come in. “We are the Australian rights holders so we can only show the pictures that are provided by the actual host broadcasters. They made the decision not to have the athletes enter the stadium. They made the decision not to show the flag bearers and I’m furious! They are actually wrecking a tradition that is so important. “You want to see the athletes come in. You want to see them jumping in front of camera. You want to see them celebrating 11 days of great sport. “We missed out on all of that. And I tell you there’s no athletes in here. I’ve never seen the stadium so empty halfway through a ceremony. “It’s been the most wonderful 11 days but unfortunately tonight, the organising committee together with the host broadcasters just didn’t get it right,” Zempilas said. “We did not have pictures available to us to bring you. It’s a disappointing conclusion. They also slammed the lengthy speeches and self-indulgence. “It’s so wrong, Baz,” said Griggs. “To be brutally honest, most of the athletes left during the ceremony,” said Zempilas. While a network may have expressed concerns with a broadcast in the days following a major event, to do so whilst still on air is probably unprecedented. But Griggs and Zempilas had correctly read the mood on social media, and last night were widely praised for being so outspoken. Mel McLaughlin and Jason Richardson at The Star, who followed the broadcast, acknowledged Griggs & Zempilas saying what everybody was thinking. “Joh was filthy, she had every right to be,” McLaughlin said. Aside from “Sisters (Are Doing It For Themselves”), all of the artists in that section sang songs made famous by other female Australian artists (e.g. Dami Im/Sia, Samantha Jade/Tina Arena, The Veronicas/Kylie Minogue etc. etc. It was a tribute to Australian women by Australian women. I thought it was bizarre when Kate didn’t sing “Bedroom Eyes” and it took me until Dami’s performance to make the connection. The difference is the other artists weren’t standing right there when someone else sang their song. For Kate Ceberano to waltz out 2 secs after Bedroom Eyes had been massacred and belt out Boys In Town was nothing short of bizarre. I would question whether it was able to screen athletes arriving earlier but unfortunately I am still awaiting Seven to clarify. Joanna said that they were only allowed to have one camera filming in the stadium during the pre-show, for use in news broadcasts only – she made that very clear in her comments last night. Johanna Griggs has corrected the article that you shared. So much for ABC news being better than the commercial networks. People just need to do their homework before blabbing. Can I just say what a legend Kurt Fearnley is. Isn’t it funny how – when everybody was praising the Games – Seven was happy with people thinking they were responsible and it was “Seven’s Games”. But when people start criticising the closing ceremony Seven wipes their hands of it and dumps on the “host broadcaster” whom nobody had previously known had existed. Seven didn’t dump on the host broadcaster, they dumped on the Comm Games organising committee, and rightly so. Joh definitely dumped on the host broadcaster live on air. Watch any replay. hmm when did they say it was their games ? Of course Seven had to show lots of ads, the broadcast rights cost a lot of money. also swimming events are hugely popular. Firstly, swimming is very popular. Secondly, ads are necessary if you want to watch for free. Thirdly, Seven did a great job of coordinating the multi-channels, so that when ads came on, you could switch channels and find another event to watch for a bit, then turn back. Least amount of ads during an event that I have ever seen and very hard to return to normal programming. This is such a hot topic today. @tenten and the rest – I suggest you scroll down to read the administrator’s comment before you comment further. He’s still trying to check if the host broadcaster had anything to do with this. Last night, I found that the Closing ceremony was not enjoyable to watch. I noticed that there were mostly some music performances during the event. The extended speeches made me feel so bored. It wasn’t a very good way to finish off the GC2018 event. I saw the segment on Birmingham last night. What an ugly, dull and boring city to host the next games. Why people from Australia travel all the way to the UK to go to places like that is beyond me.